Six years ago, when Adrian Peterson returned from a torn ACL in just under nine months to start the Vikings’ Week 1 game against the Jacksonville Jaguars, his comeback was considered a miracle of modern science. And what Peterson did that season, after rehabbing with Russ Paine in Houston, still stands out as one of the great feats in the modern NFL: 2,097 yards, 13 rushing and receiving touchdowns and a MVP award as the Vikings went from 3-13 to 10-6 and a playoff berth. 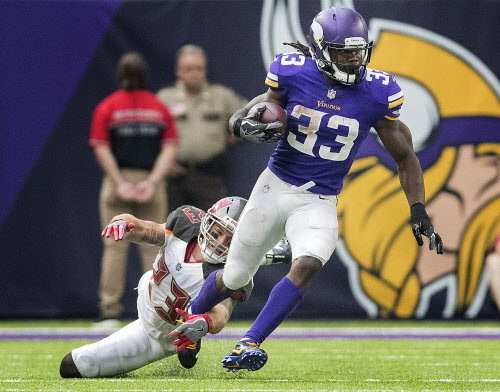 Peterson’s comeback also had the effect of demystifying ACL recovery to some degree, and perhaps that’s why few have batted an eye at Dalvin Cook’s return, just over 11 months removed from his knee injury, to the Vikings’ starting lineup. Cook had more time to recover than Peterson, and he was only 22 at the time of his injury. But whereas the Vikings were cautious with Peterson early in the 2012 season — giving him only 17 carries in Week 1 and 16 in Week 2, in a year where he’d wind up carrying 348 times — they’ve resisted the idea they’ll need to keep Cook on a pitch count. Cook’s 22 rushing attempts in Week 1 last year tied him for the third-most during a season opener in team history, and his 127 rushing yards placed him fifth, as he stole the show from Peterson in the Vikings’ Monday night victory over the Saints. If the Vikings need to lean on Cook against the 49ers to the same degree, they seem confident they’ll be able to do so. 2. Adam Thielen boosted his 2018 base salary by $1 million, and already added a $1 million boost to his 2019 salary, by surpassing 90 catches last year. He can bump his 2019 base salary again with another strong season this year, and help himself make more money in 2020, as well. Thielen can add $500,000 to his 2019 salary — currently set at $4.85 million — by surpassing 70 catches. His salary will go up by $750,000 if he catches 80 passes, and it would increase by $1 million if he posts another 90-catch season, capping out at $5.85 million for 2019. He has the same opportunity to boost his 2020 salary based on his performance in 2018 and 2019. Thielen can also land himself another $500,000 by making the Pro Bowl again in 2018, and can hit incentives of $300,000 (with 70 catches or 1,050 yards) or $600,000 (with 80 catches or $1,200 yards). Even if he hits all his incentives for this season, he’ll still be significantly underpaid according to the current NFL receiver market — and his camp would have even more reason to talk to the Vikings about redoing his deal following 2018. 4.If Cousins gets his first opening-day win as a NFL QB tomorrow, perhaps it will help him adapt his catchphrase to a Vikings-specific audience. Days after he signed with the team, Cousins filed a trademark application for the phrase “You Vike That!” with the U.S. Patent and Trademark Office, playing off the famous 2015 moment when Cousins yelled, “You like that? !” to a reporter as he walked off the field following a Redskins victory. The video went viral, and Cousins donated proceeds from the ensuing marketing effort to International Justice Mission, a faith-based organization that works to combat human trafficking around the globe. 5.Given the fact 49ers cornerback Richard Sherman has mostly stuck to one side of the field in his career — rather than shadowing receivers like Xavier Rhodes has done in recent years — he figures to see a number of different matchups on Sunday, thanks to the Vikings’ ability to line up their receivers in different spots. But if Laquon Treadwell lines up at the ‘X’ receiver spot, as he did during the preseason, and the Vikings give Thielen plenty of work in the slot, it stands to reason Sherman will see quite a bit of Diggs on Sunday. 7.With Aviante Collins out for Sunday’s game because of an elbow injury, the Vikings could call on second-round pick Brian O’Neill as their swing tackle, should they need someone to step in for either Riley Reiff or Mike Remmers. With only seven healthy linemen currently on the roster, the Vikings would otherwise have to move Tom Compton out to a tackle spot and plug in Danny Isidora at guard if an injury happened and they weren’t ready to use O’Neill. 8.This will be the eighth time in the Vikings’ 58 NFL seasons that they’ve opened against San Francisco. The Vikings are 4-2-1 in Week 1 matchups with the 49ers, having lost 20-3 in their most recent matchup with San Francisco in 2015. That game, which saw the Vikings fall to what would turn out to be a 5-11 49ers team, didn’t exactly presage the team’s season, where the Vikings went 11-5 and won the NFC North. But the game — a Monday night matchup that kicked off at 9:20 Central time, more than five weeks after the Vikings opened the preseason in the Hall of Fame Game — caused Zimmer to tweak his routine for when he started preparing for the regular-season opener. Given the fact the Vikings have three healthy tight ends on the roster, it’s hard not to see the team’s practice-squad pickup of tight end Cole Hikutini as an effort to glean a few details about the 49ers’ offense. Teams often pick up players who had recently spent time with their upcoming opponent, and Hikutini, who’d spent four games on San Francisco’s active roster last season, joined the Vikings on Monday after recently being waived by the 49ers. 9.As the Vikings honor the 1998 team that went 15-1 and set a NFL record for most points in a season, former offensive tackle Todd Steussie will blow the Gjallarhorn before Sunday’s game. 10.ESPN’s excellent “NFL Matchup” show returned this weekend, with Matt Bowen joining Greg Cosell and Sal Paolantonio to break down games around the league. During its segment on Vikings-49ers, the show took a look at how the 49ers use 21 personnel (two running backs, one tight end, two wide receivers) to stress an opponent’s linebackers and create matchup issues. It’s a favorite look for the 49ers, who could use it to keep the Vikings in their base defense and counter the Vikings’ ability to be aggressive with Eric Kendricks and Anthony Barr.